The simplest way to find out more about my furniture is to call. I pick up the phone myself, I'll answer your questions, and that's that. No sales pressure, hopefully no phone tag. I find e-mail quite handy but I feel furniture design is a two way communication process which works best in person or over the phone. 8 - 16 weeks is a general range. Sometimes single smaller pieces can be slipped in with other projects sooner. I prefer not to rush- if I'm trying to make something that will last for several generations, it helps not to have to try and have it ready "by Christmas". I have cutting lists and drawings for all these pieces, but I make every one from scratch to include each customer's preferences. Once you choose which pieces you are interested in, the next step is to discuss construction details- wood species, adding tenon pins or corbels, grain matching and preference, choice of finish, time frame and overall budget. I can send you a quote via email. It is very easy for me to make small modifications, a little higher, add a drawer, use a thicker top, etc. Generally speaking, a 5% cost increase will cover these kind of changes. I enjoy making them, so each client of mine can have something unique - something just for them. Prices for standard additions such as through tenons can be found in Construction. I also have a number of custom pieces on the site which I have kept the drawings for. I can reproduce these pieces, or modify them. Sometimes these custom pieces grew out of spectacular wood finds that I may not still have access to. The prices shown reflect the wood I used, so they are best seen as a ball park. Depending on the wood chosen, the prices of custom pieces can be very flexible. It is important to set a budget range, and a time frame. It will add at least $480 to design a unique piece of furniture. This covers 3 hours to discuss options, 3 hours for a drawing and cutting list, and 2 hours of adjustments in the shop. Custom pieces are essentially "prototypes" and generally cost at least 20% more to construct than comparable "stock" pieces, as I must work more slowly- the design process doesn't stop until the finish goes on. Sometimes the wood costs cannot be totally predicted until the wood is actually purchased. With small projects or extremely complex large projects, I prefer to work on a time and materials basis. After an initial discussion or two, once a budget range is established, I will usually send a sketch and a quote to clients. After receiving a deposit, I then produce the drawings, which are faxed for approval, and any samples of wood or leather etc., are mailed. I do the consultation and drawings for $60 per hour. When the design is finished, the customer owns the drawings and is free to have someone else actually build the kitchen, or contract with me to follow the project through. I can do some general contracting in a kitchen to ensure that floors, tile work, range hoods, lighting etc., are done to accomplish the goals of the design. Furniture design is the heart of my work. From the shape and form, through the function, to the way I handle the trees to get the most out of the colour and grain of the boards - my goal is to build a useful piece of furniture that is a work of art. It might hold your socks or your cookie sheets, but I want it to hold your attention too - to be something in your house you look forward coming home to. To inspire everyone who sees it. To remind you of our time working together to create it. All prices are in Canadian funds. Current exchange rates can be calculated below. My bank will charge 1 - 2 % on top of posted rates. For large sums, obtaining a bank draft in Canadian funds from a currency trader may save you money. Terms of Purchase: 50% deposit to initiate the order, 50% on pickup/delivery. Prices are always in Canadian funds at time of conversion. $US personal cheques are fine- please make payable to "Ben Barclay". 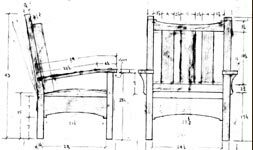 Furniture is property of Ben Barclay Wood until paid for in full. Custom work: $60/hour with suitable deposit required and weekly or monthly reckoning. Delivery: Prices include wrapping, but not delivery. Please see Shipping for more details. Prices of Details: For prices of specific details like through tenons please see Construction. Furniture stores tend to buy product, and mark it up to a retail price. Traditionally, they mark it up more than they need to, so they can offer "sales" and "discounts". Having been a wholesaler to a store, and seeing how the industry works, I can recommend bargaining with stores as a wise consumer practise. I however, have chosen not to be a store, but a crafts person. My prices reflect the labour, materials, overhead, and administration time it takes me to make the furniture. As I prefer an honest, straight forward approach, I have no "mark up" to bargain with. Sometimes I can reduce the prices you see on the site by changing the design, or waiting to combine orders or shipping, or searching for deals on lumber. Also, feel free to phone me up and say "Hey Ben, I have $_____ and I need a _____, what can you make me for that?" Just because the dresser on the site is $3,500 doesn't mean I can't build a dresser for $2,500, or $4,500 for that matter. To me cost is an important design issue, and I don't mind trying to work to a budget. Credit Cards: The main reason I don't offer credit card service, is to avoid adding the 2% - 5% mark up they charge. Air miles are a good way to try and get this mark up back, but hopefully we are both ahead not tangling with it in the first place.